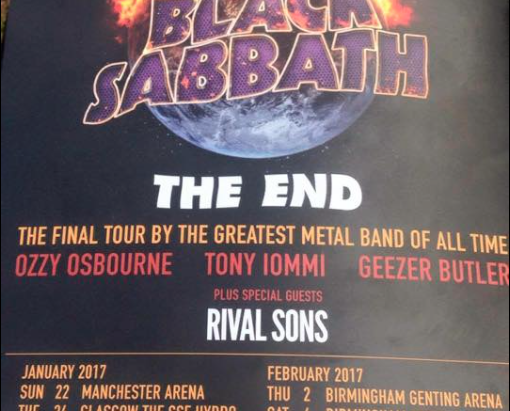 The mighty Black Sabbath, who are scheduled to perform their final UK show at the 2016 edition of The Download Festival this weekend, look like they have one more surprise for the UK fans in attendance. The band’s farewell tour, simply known as The End Tour is currently expected to culminate at the Estadio do Morumbi in São Paulo, Brazil. However, rumours have been circulating in the past few weeks that some extra UK shows may be added, and it looks like they are going to happen. As of yet there has been no confirmation from the band’s official website. However, this leaked image of one of many flyers around Donnington Park appears to confirm that the band will return to the UK for seven more shows that include two in London, one last Scotland date and two more in the heavy metal legends hometown of Birmingham.